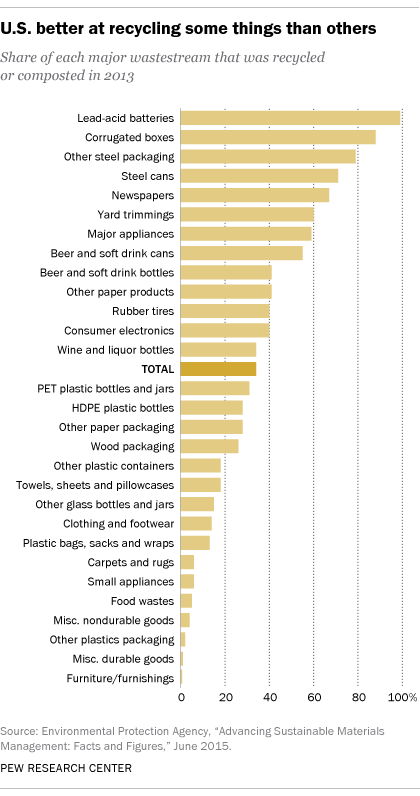 Most Americans have access to some sort of recycling program. However, the rules, practices and community norms around recycling vary considerably from place to place, contributing to dramatically different local recycling levels. People who live in places where social norms strongly encourage recycling are more likely to be aware of recycling rules, say they have more options for recycling, and see more of the waste they generate being recycled rather than landfilled, according to a new Pew Research Center survey. 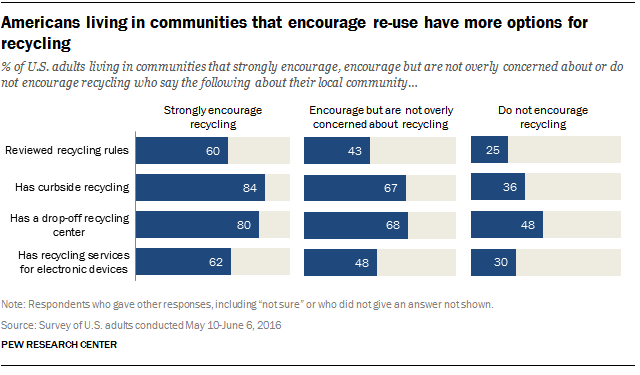 The survey, part of a study covering issues involving climate change, energy and the environment, found that about three-in-ten Americans (28%) say their local community’s social norms strongly encourage recycling and re-use. 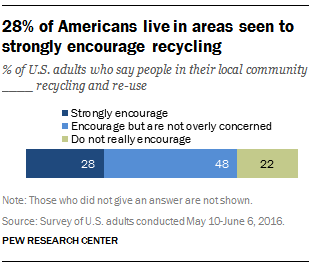 About a fifth (22%) say most people in their communities don’t really encourage recycling; the remaining half live in places where, they say, norms around recycling are somewhere in the middle. 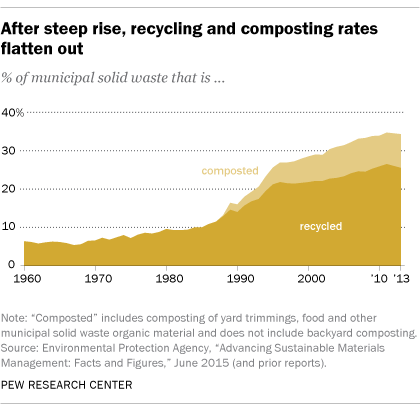 The study comes as U.S. recycling rates, after rising for decades, have plateaued. The Environmental Protection Agency says that in 2013, the most recent year for which it has data, Americans recycled or composted 1.51 pounds of waste per day, a figure that’s changed little since 2006. On the other hand, Americans are doing better at creating less trash in the first place: Per-capita waste generation has fallen from 4.7 pounds per person per day in 2006 to 4.4 pounds in 2013, and total municipal solid waste generation fell by 3 million tons. Other researchers using different methodologies have come up with higher waste-generation estimates and lower recovery rates. For example, a new report from the Environmental Research & Education Foundation estimates U.S. municipal solid waste generation in 2013 at 347 million tons, with 27% of it being recycled or composted. Columbia University’s Earth Engineering Center, using a broader definition of municipal solid waste than the EPA, surveyed state and local waste management agencies and came up with an estimate of 389 million tons generated in 2011, with 29% recycled or composted. Using data from the Columbia study, we calculated that California (53.4%), Maine (51.5%) and Washington state (50.1%) had the highest recovery rates for municipal solid waste in the nation in 2011; Oklahoma (3.7%), Alaska (4.5%) and Mississippi (4.8%) had the lowest. Looking beyond these overall recovery rates, local recycling programs vary considerably in which materials they accept and the degree to which residents must separate different materials. 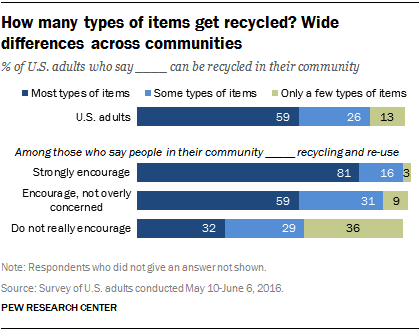 The Pew Research Center survey found that 59% of the public believes that “most types of items” can be recycled in their community; another 26% characterize their options as “some,” and 13% say only a few types of items can be recycled where they live. And the people who live in places that strongly encourage recycling also are more likely to say that most types of items can be recycled there. But the perception that communities recycle “most types of items” obscures the markedly different rates at which various types of waste actually are recycled or composted. According to our analysis of the EPA data, 99% of lead-acid batteries (the sort found in cars and trucks), 88.5% of corrugated cardboard boxes, and 67% of newspapers, directories and the like were recycled as of 2013. On the other hand, only 28.2% of high-density polyethylene containers (such as milk jugs) were recycled, as were 13.5% of plastic bags and wraps and only 6.2% of small appliances. 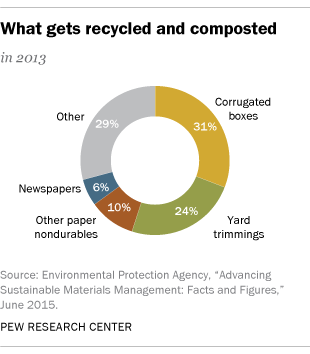 Three-fifths (60.2%) of yard trimmings were composted, but just 5% of food waste was. One category of solid waste that’s grown rapidly, in both quantity generated and amount recycled, is consumer electronics – TVs, computer equipment, phones, DVD players and the like. According to the EPA report, 40.4% of the 3.1 million tons of consumer electronics that entered the wastestream in 2013 were recycled, up from 30.6% in 2012. 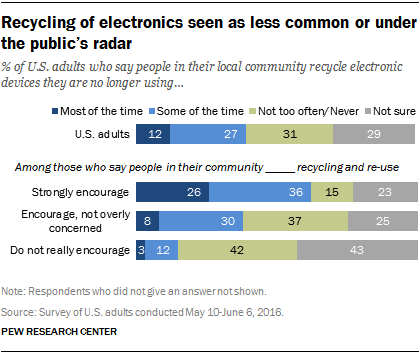 About half (48%) of adults in the Pew Research Center survey say their community has services for recycling electronic devices, though about a third (34%) say they aren’t sure. People living in places that strongly encourage recycling in general are much more likely to say that electronics are recycled in their local areas most or some of the time, compared with people who live in communities that “do not really encourage” recycling (62% versus 15%). A challenge for many community-based recycling programs, especially in recent years, is that they’re losing money. Recycling, at root, is a commodity business, and lower prices for wood pulp, aluminum, oil (out of which plastics are made) and other feedstock commodities are pushing many recyclers into the red. That, in turn, has forced localities to pay recycling companies to accept their collected bottles, cans and paper, when just a few years ago the recyclers paid them. Advocates say there are other important considerations in favor of recycling – prime among them that making products with recycled materials rather than virgin stock uses less energy and thus creates fewer greenhouse-gas emissions. The EPA estimates that the 87.2 million tons of materials recycled or composted in 2013 reduced greenhouse gas emissions by the equivalent of more than 186 million metric tons of carbon dioxide. However, critics point out that almost 80% of those greenhouse-gas benefits come from paper and paperboard recycling, and most of the remainer comes from recycling steel, aluminum and other metals. Note: The topline for the Pew Research Center survey is available here (PDF), and the methodology is here.